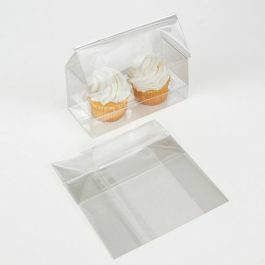 Create a great display for double mini cupcakes with this cupcake bag set. 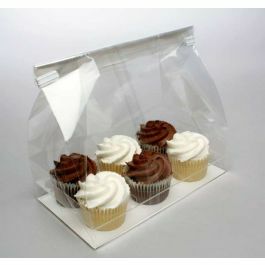 Our CBG9 mini bag set measures 5" x 2 1/4" x 5" and holds two mini cupcakes. This set contains a clear flat bottom gusset bag, plastic tray, and a white bottom paper insert. The paper insert offers added stability and an upscale look. Heat sealing is not recommended. Our mini cupcake packaging sets are designed to show off bite-sized treats. The CBG9 set is perfect for holding two mini cupcakes. This three-piece set includes a 5" x 2 1/4" x 5" flat bottom gusset bag, a plastic tray, and a white paper bottom insert. The material is food safe and made of BOPP material for a crystal clear display. The white paper insert offers sturdy support and a high-end look. The bag has expanding side gussets so your frosting and decorations stay intact. To use the insert, fold the long tabs up and place on the sides of the bag to keep gusset from touching contents. Fold the short tabs down and place on the front and back of the bag. Bags can be closed with tape, labeling, or stickers. Clear stickers are included for a tamper-proof closure. Heat sealing is not recommended with this product. Food safe. Outer Dimensions: 5" x 2 1/4" x 5"
The primary use for CBG9 is for holding two mini cupcakes or muffins. Not sure if this is the correct size? Request a sample here.